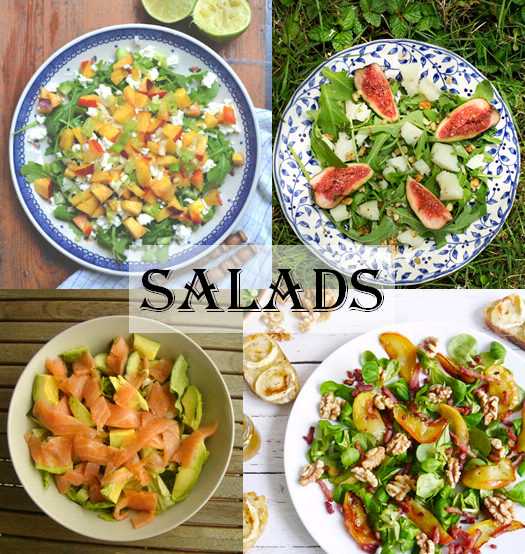 I guess this is the time of the year when we all dream of an Indian summer and already crave a good salad, right? Mixing fruits and vegetables and sprinkling it with something crunchy is my favourite way of eating at this year. Sarah’s Kitchen: Salmon and avocado is always a winner. Proteins, omega 3 and all the nutrients you can possibly imagine in one divine mix. Iris of SWONDERFUL: Manchego and fig salad – just when I thought I had tried all possible salad combinations it turned out I’ve never tried two of my favourite ingredients together in a salad. Tine at Home: Everything is better with bacon. Evidence number one: apple and walnut salad. And did I hear someone saying Sancerre? Alica’s Kitchen: Peaches and spring onion – the perfect barbecue salad that I´m sure tastes just as good even if you don´t have your own Weber grill. Cookanista: Even if you don´t read Dutch you cannot go wrong with this lovely chicken and mango salad. I´m sure it will not only make you healthy, but also lighten up your mood! Linn of Rausmat is a Norwegian food blogger, social eater and Eurocrat. Ever since she found out that actually not everyone speaks Norwegian, she decided to set up an Instragram account in addition to her food blog to share hery passion for food, travel and living the good life in a language all people understand – pictures. From sour dough experiments to culinary adventures – making each calory worthwile! Always on the hunt for the perfect chocolate mousse (and a good bargain). Follow her on Instagram, Twitter & Facebook.